There aren’t many tools you need to blog. In fact most blogs will just require a web browser such as Internet Explorer or Firefox and an internet connection because they use a web-based interface for posting to your blog. There are however lots of tools on the internet that make the process of blogging even easier and you will probably find you will discover your own favourite blogging tools as you continue to develop and write to your blog. There are tools such as RSS (Really Simple Syndication) readers to help keep you up-to-date on what the blogosphere is discussing on the subjects that matter to you. There are social services such as Twitter that allow you to follow and share information with peers, colleagues and “thought leaders” within your industry; there are also online bookmarking services such as Delicious which allow you to bookmark web pages which can be accessed from any computer, anywhere in the world and also shared with people in your network. Other tools like Microsoft OneNote which is part of the Microsoft Office package allows you to collate snippets of information as you browse the web. A fairly recent discovery for me was Microsoft’s Live Writer, a free Windows blog editor which works with most blogging platforms and makes blogging as easy as writing a Word document. If you spend a lot of time away from a computer and an internet connection, its always handy to carry a paper-based notepad where you can jot down any blog topic ideas and outline or even write full posts. If you have internet access on your mobile phone, you might find Google Reader Mobile useful to read your news subscriptions on-the-go. A Twitter account – network and share information with peers and key figures in your industry. Tweetdeck is a must-have application for all Twitter users. If you are unsure whether your company should be blogging on your corporate website here are ten reasons why you should consider it. You might also want to read our overview of blogging to understand what all the fuss is about. A blog is an inexpensive marketing tool. They allow you to talk to your customers in an informal way. A blog is a good way to inform and educate visitors about your products and services. A blog can make your company seem more approachable. Having a blog on your business website can help its search engine ranking overall. A blog can help you generate sales leads. You can start a two-way conversation with your customers and show that you listen to what your customers have to say. Your customers comments can help you develop products and services that better match their needs. A blog lets you communicate your company's expertise within your sector/industry. Positive comments left on your blog from happy customers act as recommendations for your product or service. What Exactly is a Blog? The term “Blog” is short for “weblog”, blogs are essentially a type of website which initially became popular through personal online diaries and slowly gained in popularity from 2000 onwards around the time Blogger.com was launched. Why do people use blogs? Blogs became popular because they made it possible for non-technical people to publish their thoughts online with ease. Blogs also opened up a two-way conversation with the blogs audience through the “comments system”. Blog comments allow readers to voice their opinion by appending messages directly beneath the blog post for all the other readers to read and join in the conversation. Blogs normally focus on a particular subject and contain text, images and links to other web pages and blogs. Now-a-days blogs can be categorised in many different ways and written in lots of styles. There are corporate blogs which are used for either internal communication or external marketing, branding or public relations purposes. There are personal blogs which are essentially online diaries or commentaries about the lives of ordinary citizens. Then there are lots of blogs which are focused on a particular genre such as gadget blogs, travel blogs, music blogs etc. Blogs are formed of numerous “posts” which are individual entries posted to the blog. The blog posts are usually arranged in reverse chronological order so the latest post is at the top of the main page. Each post maybe categorised using a number of “tags”, these tags are essentially categories the author (“blogger”) has created to categorise his or her blog. A blog website is formed of a main page which features the latest dozen-or-so posts, archive pages which are usually formed of a number of pages containing a months worth of posts. Tag pages featuring posts categorised with a particular tag, and finally individual post pages, which contain just one blog post each. This structure allows visitors to easily browse a blog by category (tag), date, or simply read the latest entries. What is a blog feed? Another way blogs differ from other forms of website is that they facilitate “syndication” which means visitors can subscribe to a blog feed and read the latest blog posts as they are published without visiting website directly. This functionality can be found on most blogs where you see the orange RSS symbol, like the one below. RSS stands for “Really Simple Syndication”. Clicking on the orange RSS button will normally take you to your RSS reader of choice, depending on the web browser you use and if you have configured an RSS reader. Once inside your blog reader you will typically be informed of your subscription to the blog to which you just subscribed. If you are new to blogging and are interested in starting your own blog or joining the conversation in the Blogosphere. The first step is to begin by signing-up for one of the RSS readers above and subscribing to blogs of interest to get a grasp for how blogging works, how they differ from other forms of media and from one-another, their informal editorial style etc. This research will give you the confidence and knowledge to begin blogging on your chosen topic. If you already have a website and for whatever reason want to change the domain name of your site doing so may cause some unwanted side-effects that you may not be aware of. However if the correct techniques are followed these can be minimised. Your domain name no longer reflects your business/products or services. Your domain name expired and you cannot reacquire it. Your company has changed names or has been rebranded. You have since purchased a “better” domain name. You want to have a “.com” rather than a “.co.uk” domain etc. Search engines will not update their index of your website straight away, so you will loose visitors for up to 6 weeks (approximately) unless you redirect each page to its new location. You will loose Google Page Rank (Your ranking in Google) temporarily until Google re-indexes your new domain name. You may even loose your Google Page Rank altogether if you do not put redirects from your old domain name to your new domain. These redirects need to be the “301 Permanently moved” variety. Your domain name will need updating in online directories, business stationary, other websites, which can be a time consuming and potentially expensive process. If you are one of our clients, you’ll be happy to know we will always make sure that we follow the correct procedures to make the process of changing domain names as smooth and painless as possible. Web analytics is a term used to describe the processes involved in recording and analysing how visitors use and discover your website. What kind of statistics will web analytics show me? There are numerous web analytics software vendors, however if you intend to use Google Adwords pay-per-click advertising, Google Analytics will draw information from your Google Adwords campaigns and let you analyse how well your visitors are converting, so it makes sense to use Google’s analytics offering. 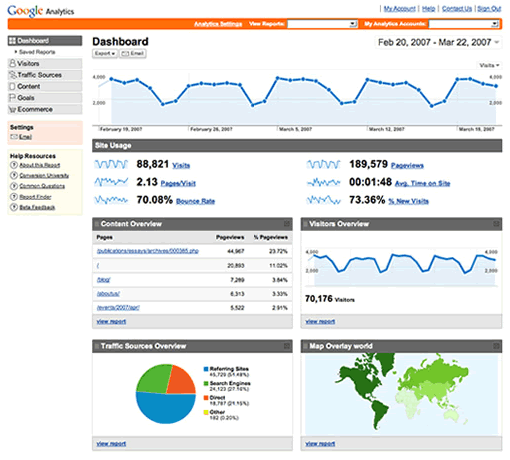 Google Analytics is a free but powerful web analytics tool. Google describes it as “Enterprise-class”, but don’t let that put you off. Even though Google Analytics has a lot of advanced features, it’s quite easy to just stick to the basics and get just the information you need right at your finger tips. You can even customise reports to show only the data you are interested in and have them emailed to you or a colleague on a regular basis! What’s more our Search Engine Marketer has passed the Google Analytics Individual Qualification, so we are well placed to help you make the most of Google Analytics.